I had an interesting little event happen to me the other day. It wasn’t anywhere wild. Or remote. As is the case with many of my days, though, I was outdoors. And, as usual, I had more than one means of fire-lighting on me. My go-to ignition device is the FireSteel or “ferro rod”. This is part of my core outdoors kit. But I always have at least a second, often a third, means of quick ignition on me. This is just habit. That’s before we start contemplating employing methods of fire by friction. So, I don’t include a knife or cordage in this calculation. I’m talking about means of quick ignition. Typically, for me, this is a cigarette lighter and/or a box of matches in addition to the Firesteel. I have a preference for matches in cold environments (more on this below). I like to develop good habits and systems while in relatively benign situations or environments then carry those habits over to wilder or more remote settings. So, I was running a week-long training course in East Sussex, England. During one of the days mid-week, I wanted to melt the ends of a couple of pieces of paracord, as you do in order to stop them fraying. I took the cigarette lighter out of my thigh pocket and went to light it. I got sparks off the flint but no flame from the lighter. On closer inspection I could see there was no fuel in the lighter and that the reason for this was the plastic body of the lighter was cracked in multiple places. This was the first time during the week I had used the lighter and it was fine when I put it in my pocket at the weekend. So, at some stage in the previous few days the lighter had been cracked in my pocket. I don’t know how. There was no incident or impact in my memory that I could link it to. Clearly after the lighter had been damaged, the fuel had escaped and evaporated. Over what period and in what location, I’d never know. But I was out in the open air all week and I was thankful the fuel had dissipated safely into the wider atmosphere. I borrowed a lighter from one of my team and melted the paracord. No big deal. But it reminded me of a story related to me by one of my old mentors about an incident during an Arctic training course. Unbeknownst to him, a student had a damaged lighter in a trouser pocket. It was so cold outside that the fuel had not evaporated from his trouser material until he entered a warm indoor environment. A full cigarette lighter’s worth of fuel evaporating from your trousers when near to hot stoves, open candles in an enclosed space has the potential to be a much more dangerous situation than the one I had faced out in the open air in summer. This, however, is one of the reasons I prefer matches over cigarette lighters in cold environments. Regardless of whether you visit cold places, it’s always good to examine some of the dogma of bushcraft and survival. One of the dogmas is always have multiple means of lighting a fire on your person. This is something I have engrained in my habits and personal systems. Even though I’m careful with my kit and I rarely lose or break any of it, you never know when you are going to be reminded of the value of packing more than one means of lighting a fire. It didn’t matter in Sussex when I needed to melt some string during a course. It wasn’t an essential action. I wasn’t miles from resupply. I had a colleague with a lighter. In more remote settings, particularly on my own, it might have been a more critical failure if I’d really needed a fire. Because I always pack them, I still would have had a Firesteel and matches. That’s why I make it habit to have these things in my pockets. Paul, as those lighters are so cheap and mass produced on a huge scale there are bound to be failures. I have a Zippo petrol lighter which is very robust however it’s downfall is that if its not used for a while the fuel also evaporates! I also have one of the first gas turbo lighters which is better in many ways. It’s more durable an a disposable, it doesn’t leak and it can be used upside down which is useful for lighting stoves and wood fires alike. I prefer to carry a clipper brand lighter as one of my firelighting methods, I carry an bright orange one so that if dropped it should be highly visible. Before leaving for a trip to the woods I ensure it is filed and that the flint is good. I find the case to be more durable than a disposable lighter that you have pictured above, even if they do cost a little bit more. They also have the addition that if they do become damaged you can remove the flint wheel from the lighter body and use it in the same way as the Adventure Medical Kits Fire Lite sparker, giving you two methods of firelighting with one item. I`m with you Ray. The clipper lighter is the most robust re-fillable lighter I have ever used. They even make them with a stainless case now for about 4-5 quid. I am like you in that I always have a ferro rod because of its obvious reliability. They are also much easier to secure to your person as well. I personally have not had one fail on me, nor heard of one failing due to a cracked case. However, I have heard directly from friends where they have had issues due to extreme cold, wetness, and high elevation. I also have a friend who is a trapper in northern Canada that carries a ferro rod in addition to the lighter in that if he falls into a creek, or the lighter gets wet in any other way in extreme cold, it would flash freeze the mechanical parts rendering it useless. Nonetheless, its hard to argue with a device that gives you a radiant flame thousands of time over. I am assuming BICs are likely the more durable; the plastic appears thicker (my guess), and the case is rounded with no flat surfaces other than the bottom – the rounding being structurally stronger that lighters with long flat surfaces. An interesting article as usual. I must clay I have never had anything happen to my mini bic that I carry. Like you I have always carried 3 ways to make fire. However, recently I purchased a metal case that the bic slides into and protects the body from damage and breakage. These are very inexpensive and width only a few ounces and yet I cannot see anything breaking one. Hi Paul, I think that a possible solution is to wrap these Plastic lighters (Bic, Clipper or other brand) with some duct tape. In this way we can use the tape to repair something or as a non Eco friendly tinder etc… and the roll can protect the lighter from small soil impacts. I repeat myself but your blog it’s a very interesting and inspirational resource ! I carry a couple of ferro rods in my EDC and I also have a peanut lighter. I have a True Utility peanut lighter that uses petrol and it has never let me down, it had spare flints and a spare canister of fuel. The O ring provides a perfect seal, even though it is in my pocket all the time. There are some more expensive models but it does the trick for me. I left a lighter in my (dark green) tent during a May trip here in Turkey. The sun is relatively mild in May but the day warmed rapidly. I heard a muffled thud. Later I discovered shards of plastic and the metal workings of the lighter. Lucky there were no other sources of ignition nearby until the fuel fumes dissipated. When I first became interested in bushcraft I thought why do people carry this and that piece of equipment for either days out or longer term camping. It soon becomes apparent that after the evolution of my/your systems that the reason people carry this or that is because it works and invariably we all end up with the same stuff! Great reminder of being informed by the everyday, thanks Paul. Those lighters seem to break easily. One of my son’s friends, pre-teen, fiddled with the top to get a ‘better’ flame while we were out and about and when my son tried to use it a little while later flames almost engulfed his hands. He had the sense to throw it away thankfully. There were cracks too. Seems that something that can’t take a bit of fiddling with unskilled/cold fingers is more of a hazrd than a help. I will be investing in something a little more robust regardless of where I go becuase it happened too easily for my liking and even in the not-so-wilds of East Sussex your kids can get burned! I tend to be relatively close to civilisation when I do this kind of stuff anyway, there’s only so far kids will walk, so I have fire steel, waterproof matches (don’t you just love Pinterest!) and my lovely flint and steel with some charred punk wood if I remember. Havent quite got to the friction firelighting stage yet! Hi Paul,your lighter story reminds me of when I was in Mexico many moons ago and was still smoking.i stepped out of my hotel room to have a smoke on the balcony ,I was half way to lifting the lighter to my face to light my ciggarette when it exploded in my hand.what I’d not thought of was I’d had the lighter stored in the room which had air conditioning.of coarse me walking out into hot air had made the fuel inside explode.thankfully I was ok just shocked,glad I don’t smoke any more.also I always carry a ferro rod with me that fits nicely in my leather man pouch next to it. 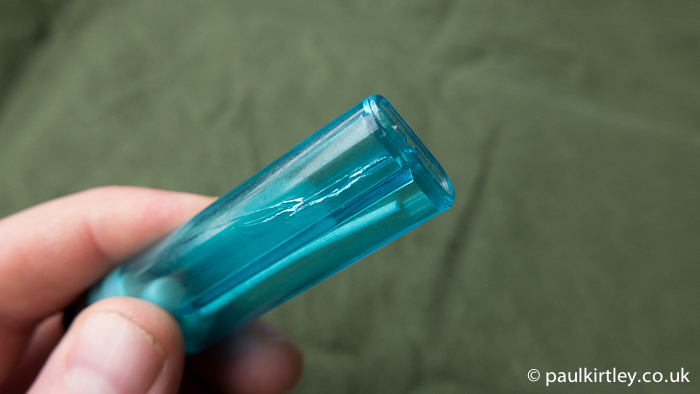 I don’t trust plastic lighters … but for a different reason. A lot of people say they fail in cold weather. 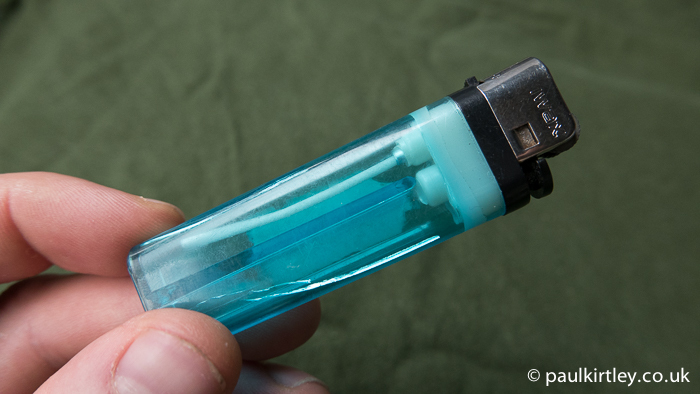 Over here, where there is virtually never ‘cold weather’ plastic lighters crack because of the heat or the fuel inside simply escapes through the lighter’s valve. Often they simply blow up if you forget them on the dashboard in the car. I’ve tried Zippo lighters and storm-proof lighters but I’m not really happy with them. To tell the truth I’ve used the soaked cotton from a Zippo and a ferro-rod to start a fire on a couple of occasions. So my preferred methods/tools for starting a fire are, ferro-rod, matches, and lastly potassium permanganate and glycerine. By the way, ‘here’ is Malta. Keep up the excellent work for it is much appreciated. PS Greeting to all your readers. Hi Paul. Yes those 6 for a pound lighters are rubbish. I still own a clipper over thirty-five years old, from when I used to be a smoker. They don’t crack, even at that age. I bought a number of lighters a few years back and put them in a bag in storage. I went back to them periodically and they were ok. Then on one of the checks nearly all of them had developed cracks. These were poundshop lighters never had any problem with bics or clipper lighters. I too have broken many lighters or had them empty out in my pocket because the valve was depressed. What I’ve gotten in the habit of doing is wrapping my lighter with a few feet of duct tape and then I slide the whole thing inside a sleeve made from a bicycle intertube. This has stopped the breakage and the leakage. It also provides a couple of ready tinder sources. I use a BIC lighter (better quality) with a small rubberband on it so it cannot release the gas. My experience was after two days in my pocket (trousers) the lighter was empty. So not in mt trousers anymore and “locked” with a rubberband, which can also be used as emergency tinder. Ofcourse I had a backup firesteel but it was a reminder. K&M match case carried securely in a hand made leather case on my belt. A blast match with a long enough landyard that it can be used with out untieing from my belt. ( It can be used one handed need be) And a fire kit in my pack in a otterbox that has a quality fire piston– several accelerants and a small headlamp—— I never rely on a lighter ever! I learned the hard way. Now I have seen exotac has a product called the firesleeve that is designed to protect a lighter from impact and moisture. That might make them a better gamble. I always carry a zippo petrol lighter, I also carry a small fuel bottle with a spare wick and flints in the lid. I also keep the lighter in a small zip-lock plastic bag to reduce evaporation . I’m an engineer by trade and as Harland said we were told not to use plastic or gas lighter’s. I have experienced problems with ferro rods either snapping into two pieces or just becoming de attached to the handle so no means of making fire is failsafe. Having two firestarting items on ones person and a lighter in the toilet kit seems like a good idea. Hi Paul. I always carry a Zippo lighter in addition to fire steel and matches. Also i carry a tiny canister from Zippo with some extra lighter fuel (gasoline). Since the fuel in you Zippo tend to vaporize over time, I have cut a piece of a bicycles rubber hose (like a “ranger band”) which I pull over my Zippo lighter to seal it of better. Thus less vaporization, fuel last longer. Also this piece of rubber can be used as tinder/to boost a fire if need (like if when wood is damp/wet) , since as yo know rubber burns very well – and it last a bit also. Adding: If and when I carry a disposable lighter as you show here, I use rubber band around it, just under the leveler you press to release the gas. This so the leveler does not accidently get depressed in my pocket and thus emptying the lighter. As for your question, I have not experienced cracks in disposable lighter before, but I have experienced it been emptied when carrying it in my pocket for reason explained above. My preference goes out to a ‘Turboflame’ lighter. It is refillable and as the name suggests it delivers a very powerful, ‘turbo-esk’ flame which is hard to extinguish by even the strongest of winds. It does a little job of sealing the end(s) of a piece of paracord very quickly, efficiently and effectively. I even have a little adjustable stand for it as the lighter has a little ‘lock’ position on it allowing you to use both hands should you require. I don’t recall them being terrible expensive and you can get them in a variety of colours. Mine is in a matt dark green! Hope this is of any value to you. I forgot to add that to the best of my recollection I have not ever had the experienced you have had with a disposable lighter breaking in your pocket. Did you have any other items in the same pocket that could perhaps have put pressure on the casing as you knelt down for instance? Nowadays I carry a ferro rod and a disposable lighter as back up. I have experienced quite a few broken lighters over the years (used to be a smoker), fortunately without any harmful mishap occurring. I have seen more near accidents with people having boxes of matches, worse still, those old books of matches in a hip pocket. My suggestion would be to place your disposable lighter in a two-inch length of foam pipe insulation…….this will greatly reduce the risk of impact fractures. My brother has a habit of carrying matches in his pocket but came to grief when he fell and the matches spontaneously ignited! They were the Swan Vestas type , and not safety matches. May well be worth another mention at some point. Paul.. I to always carry a ferro rod but along with it I always carry matches and a steel zippo lighter in a leather case clipped to my belt. I just purchased a butane insert for my Zippo. It seems to have a nice strong flame. Great article on forming a habit! I personally have never ever checked the body of the lighter. If it lights up, I’m happy! Now, I’ll have to make it a habit! Thanks Paul! Last winter here in Finland in about -20 deg C, I tried to light a candle using one of these same lighters next to a frozen lake. I was barely half an hour from home so I didn’t have the firesteel. The candle was to commemorate a friend who had passed away the previous day. Maybe it was the surrounding whiteness or the light, but I just couldn’t see the flame even against a pine tree. Nor could I light the outdoor candle held upside down. I did see the surrounding wax just starting to melt but nowhere near the dripping point. I came back home and after a while tried lighting the candle. There were no issues. Hence my question: Does the extreme cold affect the lighting properties of such lighters? Yes those lighters leak, break, and the button gets pressed in your pocket and are unreliable.I was let down many times when carried in your pocket. But I do put them in a pot, in a tin, anywhere where they don’t get squashed and they are reliable, and cheap so I carry severa (ferro rods too)l. In my pocket is a peanut lighter small, cheap, crushproof and hold their fuel iindefinately (ferro rod too). I have a peanut shaped metal lighter that works on lighter fuel and a wick. It hangs on my keyring so goes everywhere with me. Often been used for sealing ends of nylon cord. Just have to remember to check it every few weeks as the fuel slowly evaporates even though the cap has a rubber seal. Handy device takes up little space. Great article Paul a good reminder of always have a back up, I personally use the clipper/bic style lighters never had one fail yet backed up with my trusty firesteel and matches. Having watched most of your videos. I have become an Internet student of bushcraft from many tutors such as yourself. Being a smoker of 20 years, I think my opinion my bear some weight here. Clipper lighters big or small being made of different plastic don’t or haven’t cracked like the cheap one in the photos you showed, at least not in the 20 odd years I’ve been using them. Hope this helps. For years, like you, I’ve carried three sources for quick fires during my outdoor backpacking and canoeing trips. In addition to a ferro cerium striker, I carry matches in a waterproof safe (I also keep a strip of sandpaper in the safe so I have a dry material on which to strike the matches), and a Zippo lighter. I always carry the Zippo even in my everyday pants pockets when I’m not on a trip. The “knock” on the Zippo is that it needs to be filled periodically because the fuel evaporates over time. I fill mine weekly. When I’m on an outdoor trip I take along extra fuel in a small “Zippo Fuel Canister” that is available from Zippo, or other outlets. I’ve seen them on websites like amazon for a cost of about $7.00 plus shipping. I believe if you buy them directly from the company, they cost about twice that. They hold enough fuel to completely fill the Zippo, and I know from experience that none of the fuel in that container has evaporated since I filled it about 10 months ago. I like this lighter because it is quite windproof and unlike a butane lighter, it doesn’t require holding down a lever to keep the fuel flowing. It can easily be “free standing” to allow you to light it and then use both hands to melt the ends of nylon cordage an any number of other tasks. I enjoy your posts and articles very much and appreciate learning from your experiences. ‘Haven’t a clue how it broke. Did your contact area get cold or inflamed? Perhaps it broke while not in contact with you. I usually carry Bic miniature in a special piece of cut down bike tire tubing sealed at the open end and with a grommet commercially made. Tire doubles as tinder. Somehow, I accumulate a variety of lighters that find their way into my various kits and bags. Mostly this happens because I habitually carry a peanut lighter and a small cylinder containing a few waterproof matches on the EDC carabiner hung from a belt loop. I apply a light coating of candle wax on the matchheads and insert them into water tight cylinder head first to reduce shock and wear on them from the jostling they get. Of course, I still must have a ferro rod and steel in my 24 hr and 72 hr bags, as well as on my neck in the field. Have a look at the stainless steel lighters from Clipper. They are refillable and the flints can be replaced. They also make ‘standard'(plastic) lighter with a stainless steel cover. As a wilderness guide taking walking trails in Southern Africa, they are always part of my kit. Cheers Doric. I’ll seek one out. Thanks for the tip. Groups to alert them to similar stupid pranks, which may have had serious consequences. valid point to not to put too many eggs in one basket, pure n simple things take abuse when on journeys, things break, and it’s good to have that in mind when you take gear or equipment. It could be a water filter or your water tablets have become wet or rendered useless. Good to know what to do next and have the information in your head to deal with it. campers were surprised to see be go about very professionally without a lighter…thanks to your blog and the readers tips !! Hi Paul, great informative article as ever. Like you and many others on here I carry a range of quick, easy fire lighting methods on me when out and about. As a fellow paddler I make sure I have waterproof and reliable ones on me as well. Nothing worse then not being able to get a fire going after a dunking on some white water! I buy and use the cheap disposeable lighters for work and teaching but like many find them a little unreliable for serious use. These days I tend to carry a “no messing” fire kit on me which comprises of a small watertight tin that I can carry on my belt in a pouch or just in a pocket. Inside is a Primus jet flame lighter, a small firesteel, wind proof storm matches, a mini clipper lighter a piece of tinder card, a magic biscuit and a block of sure fire wet tinder along with a small plastic vial of magnesium powder. This may seem overkill for some but despite my love of primitive fire lighting in a real situation I just want to get a fire going asap. If the tin is too big I have a small kydex neck sheath that holds a clipper lighter in it. I find these stronger and more reliable then a standard disposeable. Thanks again for the great articles. Hi Paul, great article as always. Until I read this, I’d never heard of such lighters breaking because, like you, I carry multiple sources of ignition with me. I shall maybe wrap such lighters in duck tape to give the bodies some protection. I recently bought an old fashioned fire steel which I plan to try with a piece of flint and charcloth on my next camp on Aug 30th. I’ll let you know how it goes! from cold exposure. As stated before in our conversation a waterproof bottle with “vaseline” impregnated lightly into cotton balls work excellent. I was taught during basic training with the Army to tape two lighters together using either gaffa tape or sniper tape as if one fails you always have another one to use. Just simply alternate the strike ends do they are on opposite sides if that makes sense. Paul, I carry a Zippo as I know it’s not going to break or crack when I’m out and about, but as everyone is well aware, they are hardly airtight and the petrol is usually gone within a few days. I bought a Z-Plus Butane Torch Flame Insert which has a blue torch flame. I use this one mostly for melting para cord ends etc. As I have 2 Zippos, I decided to get the Soft Flame Butane Insert version for the second one. This burns exactly like a normal lighter, lasts as long and has the added advantage that it’s in a Strong Zippo Sleve. It is of course refillable which I’m not sure if a BIC is as I don’t use them, thus eliminating the need to keep replacing the plastic cheap lighter. I also carry flint and steel and ferro rods, the Zippo is there just in case. Thanks. Tim. I prefer to carry a Bic brand lighter as one of my firelighting methods, I carry a bright orange one so that if dropped it should be highly visible. Also Clipper brand is very good . I never broken down my lighters so far, but obviusly it always could happen.. Normally the trasparent lighetrs have a more delicate plastic so I prefer others brans. When in the woods I carry in my belt pouch or oin my trousers 3 ways to light a fire : ferrorod as the way to go, lighter and matches just in case. For me that is the best setup. Hi Paul I am a smoker and have always had a lighter on me I prefer the clippers and have used Zippos but as others have mentioned the fuel evaporates, when I am out walking or camping apart from my clipper I also have a book of waterproof matches, a match safe with swan vesta matches in it and a ferro rod. I think when it comes to fire-lighting, you are absolutely right to have multiple and varied methods of ignition on your person. Yes, I would also highly recommend picking up a BIC brand. BIC’s are all made in USA or France to my knowledge, whereas the clearish square body type are mostly made in China. While hiking at some slightly higher altitudes in my mid teens, some buddies and I found that by throwing the cheap clear ones against a rock, you could produce mild/flameless compressed gas explosions. No matter how hard we tried, we couldn’t get a BIC to do the same at the same rock. Hi Paul, thanks for sharing a good source of information! Really great article you’ve written. Being a smoker, I’ve always got a light! I use a mini Bic lighter, have a spare mini Bic tucked in somewhere waterproof, BCB windproof matches for when the weather worsens and my back-up is a flint and steel with some vaseline soaked cotton wool balls. Just last week, I was hiking in heavy rain on Dartmoor. My first lighter got wet, so the one I had in a waterproof ziplok bag was there ready. Have used Zippo’s years ago… They are very good but I found if they’re not carried upright, the fuel leakage seeps through trouser pockets and irritates my skin. Really interested in the idea of a lighter case and will see what’s for sale. Let me know how you get on with finding a decent lighter case.